Financial Literacy means the ability to understand how money works in the world and take an informed as well as judicious decision with regards to all the financial activities. A person who is Financially literate knows how to earn, manage and invest money. He is familiar with financial products and applies his knowledge to make the best use of them. Financial literacy and financial inclusion are two aspects of financial stability in a country. When people are financially literate, they are more likely to explore the products and services offered by banks and use them for their benefits. This accelerates the pace of financial inclusion, where everyone can access the basic banking facilities rather than relying on the orthodox systems of money market such as borrowing money from Zamindaars or village money lenders. Unfortunately, when it comes to India’s financial literacy rate the statistics are quite shocking. According to a survey conducted by Standard & Poor’s, over 76% Indian adults lack basic financial literacy and they don’t understand the most basic and key financial concepts. While the number is much lower than the worldwide financial literacy rate, it’s roughly in line with the BRIC and South Asian nations. The survey was based on the interviews conducted on 150,000 adults from 140 countries. The individuals were tested on their knowledge of four basic financial concepts: numeracy, risk diversification, inflation, and compound interest (savings and debt). The one who answered three out of four concepts correctly, was defined as financially literate. 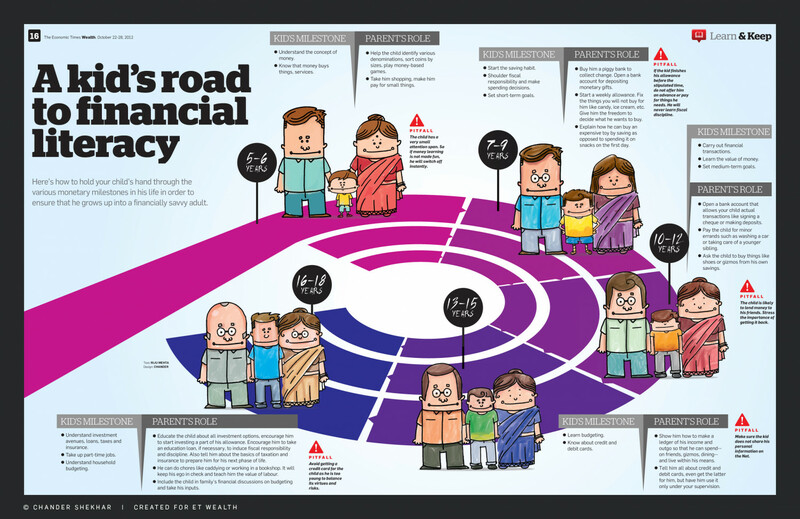 Here are some of the key findings on India’s Financial Literacy. => Only 14% Indian adults could answer questions on risk diversification while 51% understood compound interest and 56% were correct with questions on inflation. => 39% of adults who have a formal loan are financially literate, while 27% of formal borrowers are not financially literate. => A mere 14% of Indian adults save at a formal institution. => Going by the gender gap, 73% of men and 80% of women in India are not financially literate. => 26% of the adults in the richest 60% of households are financially literate, while 20% of the poorest 40% of households are financially literate. According to a survey on Global Financial Literacy in 2012 conducted by VISA, only 35% of Indians were financially literate and India was among the least financially literate countries. Clearly, the statistics are disappointing. The lack of essential knowledge on financial matters and inability to manage personal finance not only affect an household, but makes an economy as a whole suffer too. Like I said earlier, financial inclusion and financial literacy are two essential ingredients of an efficient economy. While, financial literacy can accelerate financial inclusion, the vice versa may not hold true. Financial inclusion is a priority in our country. And the Govt has been fairly active on its strategies on financial inclusion where various schemes are being introduced and awareness campaigns are being held from time to time. But owing to the existing bottlenecks in terms income disparity, poverty, gender gaps and all, the implementation of financial inclusion policies has been challenging too. For example, when Pradhan Mantri Jan Dhan Yojana, a National Mission on Financial Inclusion kicked off in 2014, the result was record-breaking. About 214 million zero balance accounts were created, which means a huge segment of population could access banking facilities at a nominal cost. But, unfortunately this many number of accounts do not ensure financial literacy. If it had, our performance in Global Financial Literacy wouldn’t have been this poor. To make things clear, financial inclusion focuses on volume or quantity whereas financial literacy is more about quality. Identify the benefits and facilities offered by banks and boycott the dodgy moneylenders. And eventually it will further the financial inclusion movements. What Should be Done to Increase Financial Literacy in India? Considering the scenario, deliberate actions to promote financial literacy is the need of the hour. Before initiating the steps, the target group should be divided on the basis of their age, income, education and gender and given opportunities to enhance their financial literacy in a more simple and easy-to-understand manner. Here are few factors that can help. Financial Literacy Month: Countries that boast high financial literacy rate observe financial literacy month. In US april is considered as the month of financial literacy where effort are taken to educate the citizens about the importance of financial literacy and why it’s important to maintain healthy financial habit. India too needs to realise the importance of Financial Literacy month. Five Reasons Why India Needs a Financial Literacy Month? Including Financial Literacy in School Syllabus: Financial literacy should begun at school stage. Recently, RBI Governor Raghuram Rajan has proposed inclusion of financial literacy in school curriculum. When children are aware of the concept, they can influence their families on the importance of savings and take necessary steps to better manage their money. Thus, spreading the concept of financial literacy by inculcating banking habits and creating financial awareness among children is a great help. Here is a nice inforgraphic presentation by Visually. Click on it and zoom it in a little to get a clear view of the content. The Role of Technology: We all are living in a digital era. The role of technology in financial literacy thus can never be overlooked. Financial literacy through the use of technology can be accelerated via three medium- computer, mobile, and internet. With mobile phones getting more convenient each passing day, it’s more easy to reach people through the platform. The platforms should so designed that whenever somebody needs financial advice, they can easily access the necessary information. Technology allows independent learning. And it’s important to exploit the means in our advantage. This is all I have to share about financial literacy in India. If you have something to add or share, please write to me or use the comment box given below. May I know what the individual can do to increase the financial literacy in the society? which topics should be included in a short course of two days for the college students. For financial literacy, the portal http://www.mylifemydecisions.in is very useful and informative. Efforts are being made to popularise the portal. It may also be included in various Financial literacy programs, so as to speed up the process of bringing financial awareness.